The colonies of Greece, before the Macedonian Age at least, were not conquests. Rather they were new settlements formed by emigration. When the population of an old Greek city grew beyond what the countryside could bear, a group would set out as pioneers to form a new colony or apoike. Not so the Romans. Colonies were outposts of the Rome. 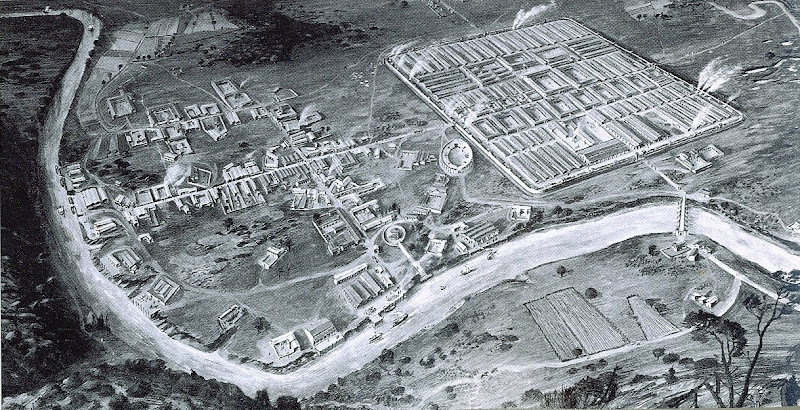 The Roman legionary fortress at Caerleon (Wales) was founded about 75 AD. It had a standard headquarters grid plan with two main roads: the via principalis and the via preatoria. At theT-junction of the two streets was the headquarters (principia) and the general’s quarters (praetorium). Barracks lay on the other side of via principalis. Outside the military camp is the town – a contrast in terms of planning.